Barangay Lumbangan in Zamboanga City has been identified as the landfill area of the city, and a dwelling place of forty parents and their children exposed to the dangerous environment of dirt and bacteria of garbage dumps. 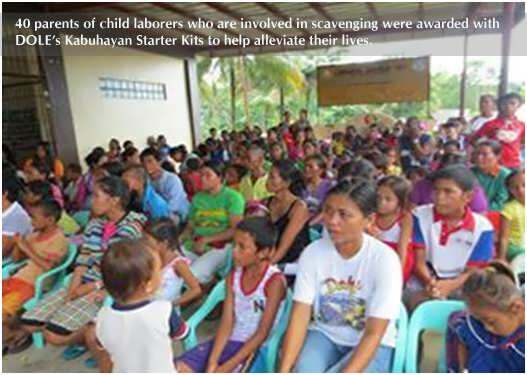 In 2012, Barangay Lumbangan was identified as a convergent area for DOLE services, focusing on the provision of livelihood skills for forty (40) parents and school supplies in exchange of their tools of trade of child laborers involved in scavenging. 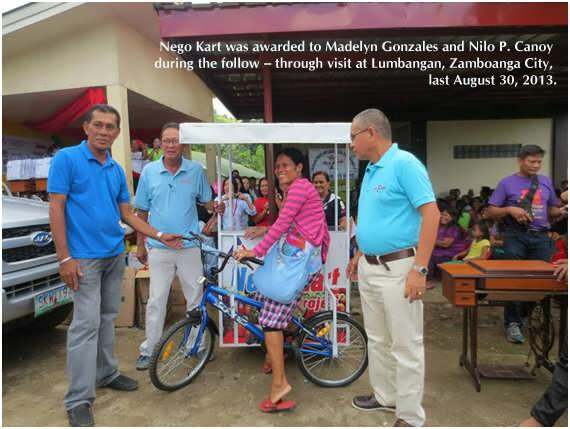 As a follow-through on the advocacy to eliminate child labor cases in the area, last August 30, 2013, DOLE RO-IX once again visited the said area, now, with the support of Zamboanga City Family Welfare Committee (ZCFWC), JCI Zamboanga La Bella, City Social Welfare and Development Office, and the Barangay Lumbangan, with the event dubbed as "Pascua na Agosto", which aimed to alter and improve the lives of the child laborers and their families gearing them towards the sense of empowerment and self - esteem. 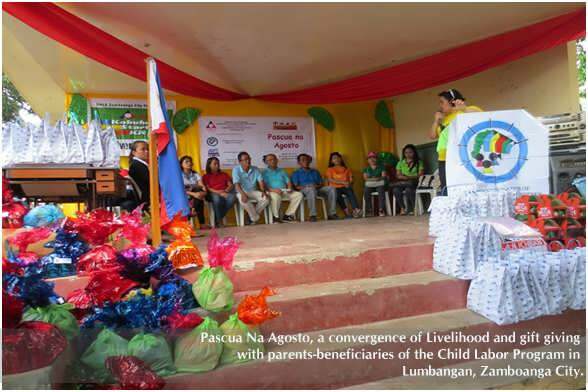 "Pascua na Agosto" gives emphasis on the transformation of the said barangay with high incidence of child scavengers into a child labor-free community, being one of the priority thrusts of the Labor Secretary Rosalinda Dimapilis-Baldoz. The program kicked off with the granting of kabuhayan starter kits spearheaded by DOLE Regional Director Sisinio B. Cano, and assisted by DOLE Zamboanga City Field Office (DOLE- ZCFO) chief Ian A. Lahi, and Barangay Chairman Rogelio Arcillas. Further, the beneficiaries and their families received delightful meals and gifts provided by the ZCFWC and JCI Zamboanga La Bella. The ZCFWC members from NY Marine Resources, YL Fishing Corp., Permex Producer and Exporter Corp., Ayala Seafoods, Mega Fishing Corp., Millenium Ocean Star Corp., Brent Hospital Inc., Southway Department Store, Shop-O-Rama, Sungate Pawnshop, Inc., Universal Canning Corp., Zamboanga City Electric Cooperative, Columbus Seafoods Corp., and Goldstar Fishing, showed their full cooperation by providing canned sardines to the mothers, and various school supplies to the children. Mrs. Florinda Francisco, one of the beneficiaries, on her message, tearfully expressed that their desire to start a business was made possible by DOLE. In return, she promised, on behalf of the mothers present, to let their kids attend school. " Tapidi kame gracias na DOLE kay por causa kanila, ya chene kame oportunidad planta diutay negosyo" ( we would like to thank DOLE because they gave us opportunities to start a small business), Francisco reiterated. Barangay Chairman Rogelio Arcillas also gave his deep appreciation for choosing his barangay as one of the beneficiaries of the Child Labor and Family Welfare Programs.